All components of registration must be completed online PRIOR to skating with TISC. whether as a Member or as a Guest: This includes I) membership application, II) agreeing to waiver, III) agreeing to Equity, Climate, Governance, IV) payment, V) registration with Roller Sports Canada. This entry was posted on Sunday, April 2nd, 2017 at 9:59 am and is filed under General. You can follow any responses to this entry through the RSS 2.0 feed. You can skip to the end and leave a response. Pinging is currently not allowed. February 1 2019- Sunday skating at the Scooter's Roller Palace will NOT take place this Sunday, February 3rd. Next skate will be Sunday February 10th at 9:30am. April 19 2018- This evening's program and skating is cancelled due to snow and wet track conditions. April 16 2018- This evening's program and skating is cancelled due to ice, snow, and wet conditions. April 12 2018- Tonight's skating program and practice is cancelled because the 200-meter track is wet. Some skaters are meeting at 6pm to skate at Max Ward Park near the airport in Mississauga. April 10 2017- Tonight's skating program and practice is cancelled due to thunder storm, rain, and wet conditions. April 6 2017- Tonight's skating program and practice is cancelled due to rain and wet conditions. April 2 2017- All components of Membership Application must be completed PRIOR to skating with TISC. First outdoor skate is tomorrow, April 3rd. Let's get rolling! WHO SHOULD COME OUT TO TISC? If you can stand on your skates, roll comfortably and hold your balance, turn right and left, hop over obstacles, come to a stop safetly, then TISC is a good place for you to take your skating to the next level. TISC welcomes skaters who looking to improve fitness; those who'd like to get into racing (road, marathons, track, sprint) and who'd like to take their skating to the next level by improving technique (skating movement), pack skills (skating with others), and speed! The 2017 season's program is set for Mondays starting in May on the 400-meter track at Ken Cox Community Center (next to Humber College) at Lake Shore and Kipling and Thursdays at Christ the King School & track at Lake Shore and Brown's Line. Youth Learn to Race program continues this year, May to August, 6pm to 6:45pm! [More information on locations. - knee and elbow protection mandatory for skaters 15-years and under, unless parents sign off to indicate otherwise. Practices will begin with warm-up lasting about 30-minutes, on-skate technique to develop efficiency, followed by drills, activities, and training geared at developing technique, agility, higher speed, greater endurance, and tactical awareness. 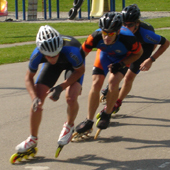 TISC has a supply of rental racing skates (low boots, carbon fiber shell, big wheels!) available to its members. Cost is $100 for the season, $50 is skates are returned within 1-month of the start of the rental. A $400 security deposit is required. Please speak with a Board Member at practice to reserve a pair or e-mail us at torontoinline@yahoo.com. In order to become a Member with the Toronto Inline Skating Club, all applicants are required to complete the following. All components of registration must be completed online PRIOR to skating with TISC. This includes I) membership application, II) waiver, III) agreeing to Equity, Climate, Governance, IV) payment, V) registration with Roller Sports Canada. Go to our TISC Membership Application.